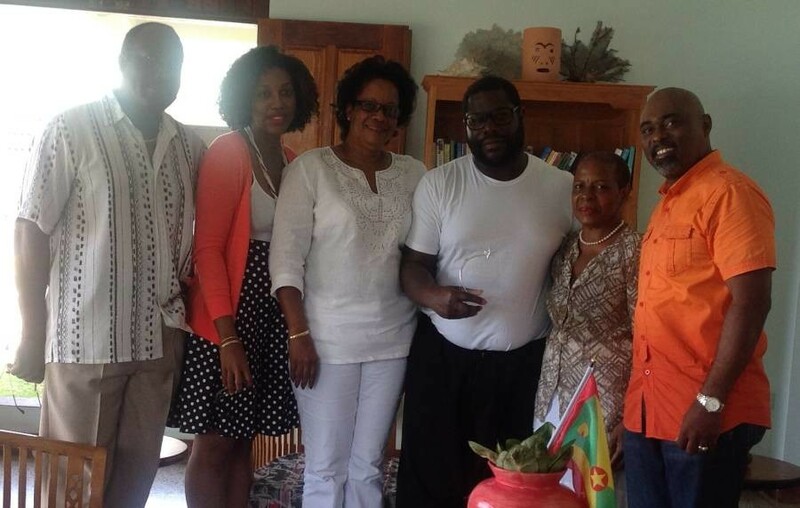 Almost two months after the announcement was made that he will be awarded by the National Celebrations Committee for outstanding performance in the field of culture, award-winning film producer Steve McQueen received his award. Culture Minister, Senator Hon. Brenda Hood and Tourism Minister, Hon. Yolande Bain-Horsford were among a delegation who attended a presentation ceremony at the Kalinago Beach Resort last weekend to deliver the award to McQueen. He was one of 16 persons and the only overseas-based Grenadian to be recognised by the NCC during the 2015 Independence Celebrations. Persons were awarded for their contributions played in national development or raising the profile of Grenada in various fields such as culture, sports, business and community development. McQueen, who is of Grenadian parentage, was on the island to do a video shoot for the upcoming 56th Venice Biennale 2015 International Art Exhibition, considered the oldest, most important and prestigious art event in the world. The Exhibition focuses on contemporary art, and includes an International Film Festival, International Architecture Exhibition, Dance,Theatre, Music and Cinema sectors. Grenada, for the first time, will be participating in the Exhibition through the Grenada Arts Council. The date for the Biennale is 9 May through 22 November. Other persons attending the presentation included Grenada Tourism Authority representatives Mr Rudy Grant, CEO, and Ms. Nisha McIntyre, Marketing Executive and Mr. Steve Horsford.